Shepherd's Pie -- The Crazy Chef style! Mash the potatoes and season them well. Then spread the mashed potatoes in an oven-proof glass dish (lasagna dish etc). Keep aside. In a pot, heat some oil, and fry the onions till soft or light golden brown now add the ginger-garlic paste and fry for a minute. Now add tomatoes, and fry well till the oil separates from the mixture. Then add the minced meat and all the spices and herbs. Mix well. 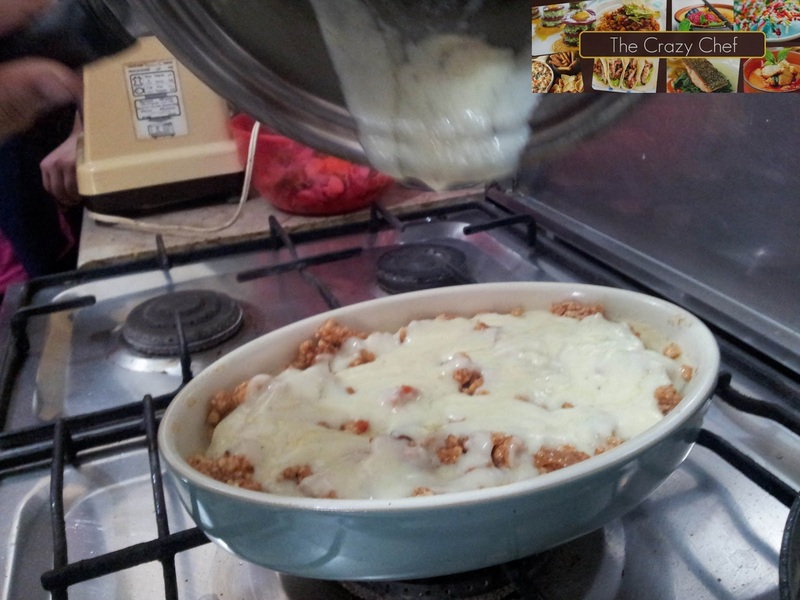 Add half a glass water and cook till water has dried out and you see the oil separate from the minced meat. 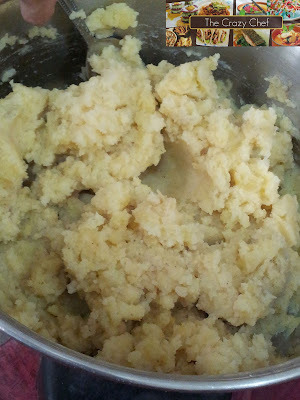 In another pan, melt the butter, add flour and make the roux for the white sauce. After cooking for a minute, stirring all the time, remove from heat and slowly add milk. Keep stirring to make sure no lumps are formed. Season with salt and pepper. Cook on a low heat till the desired consistency is attained. No assemble the dish. 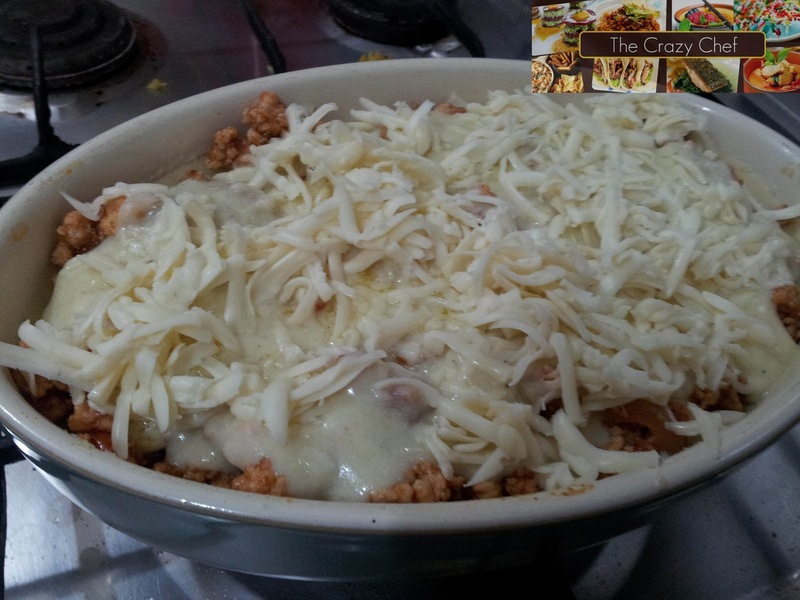 Add all the cooked minced meat over the layer of potatoes, followed by the white sauce and then the grated cheese. Put it under the gril for 3-4 minutes till the cheese melts. And serve with garlic bread! Social media can most easily be defined as a network of various websites where people meet, share and interact. I remember Orkut, MySpace and Hi5 – what fun we thought they were, the perfect way to spend the ‘extra’ time we had. Then there are Twitter, Instagram, Google+ and Facebook, totally addictive examples of social media, where users just ‘have’ to check for updates every other minute! From uploading photographs of every (and any) event happening in our lives, to sharing ‘memes’, to stalking relatives and friends, to adding/following anyone we’ve ever said hi to, to bringing revolutions and creating hate groups, to marketing for business ventures, for home entrepreneurs – social media has it all. There is a difference of opinion on the advantages/disadvantages of social media. The main argument of those against it is that one is glued to a screen all the time, causing physical repercussions; and due to the fact that all interactions on it are virtual, this reduces a person’s social skills. Obsessive use of such media may lead to detrimental physical and mental effects. On the other hand, the benefits of social media are many, from marketing your brand, to establishing a business from home, to increasing your customer base, to shortening distances worldwide; social media has for sure brought about a change globally. Anything can be made popular using social media. Lately, things related to food are very popular all over the social media, and food promotions on this platform are rampant. You see almost every other person tweeting or Instagramming the meal they just had (that includes me too). 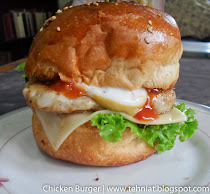 Somehow the trend for sharing the food we just had or are making on social networking websites has become very common now. People all over Instagram, Twitter, Facebook etcetera, are posting pictures almost every other hour. There are various groups on Facebook which are dedicated to food, where people share the reviews of their favourite eateries specifically highlighting what they liked or disliked. The restaurateurs and various owners of the eateries also have a chance to reach out to their customers via these groups or pages and update them regarding different activities, new launches, and the sort. Social media has had an impact on us not only individually but on the way we do business as well, the way we market our products. Earlier, we only had Ideal Bakers, Hobnob, or United Bakers, bakeries where we needed a car to get to, but ever since people have started using Facebook, and that too so frequently, entrepreneurs have had a chance to use it to their advantage and customers have the convenience of having almost everything delivered to their homes. There has been a sudden increase in the number of home-based bakers, more like a plethora of home-based bakers and caterers, because social media is indeed cheap marketing.The entrepreneur gets first-hand feedback, the advantage of word-of-mouth on the internet, sharing, easy and cheap marketing – which are all sources of benefit to any business. Taking the same example of a home-based baker, the baker has the ability to show samples to people, answer queries and get the customer’s feedback via his/her Facebook page or Twitter account. The customer, on the other hand, has many choices to choose from, does not (God forbid) have to leave the house, and can easily order online. Not just home-based bakers or caterers, but even restaurateurs use Facebook pages to introduce customers to new additions to their menus, post photos, interact with the consumers, take orders online, get consumer feedback and improve their services. Food groups are also a source of consumer-owner interaction. If we look at it from another angle, we see how much opportunity social media has given to women who have baking or cooking talents to share or convert their passion effectively into businesses. It has provided a great opportunity to many people, especially women, who, in our conservative society are preferred not to work to showcase their skills and make money from them; hence, sharing economic responsibilities with their husbands, fathers etcetera, and getting a chance to create their own identity. Speaking of myself, I started my blog way back in 2009, hoping to create my own virtual identity and for the sake of sharing my skills with people all around the globe. It does not use a lot of my time, hardly an hour for each post, including editing the photos and writing, so it is a very convenient hobby. 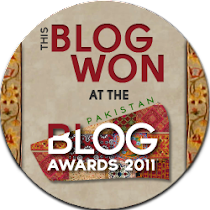 A year after my blog had started, it got nominated for the best food blog in Pakistan; later on, my blog received the award for the Best Food Blog in Pakistan in 2011, which gave me even more recognition, opportunities and chances to use it well for my own benefit; especially if I wanted to start a business in the future. Taking advantage of my blog’s age, and my award, I created my own page on Facebook, built an audience, shared recipes, took requests to attract a certain number of loyal followers, and later used my very own page to advertise my mini-catering business. 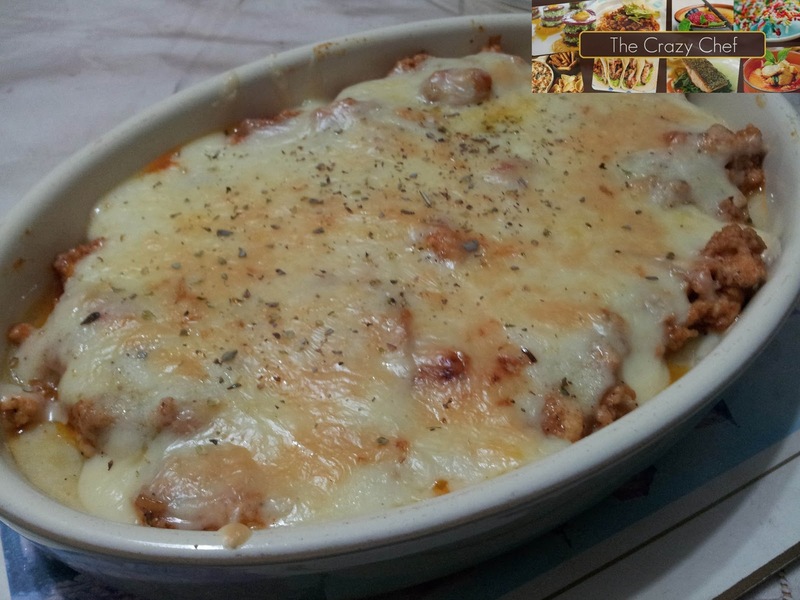 I received orders, sent customers photos of the food, and answered their queries, while sharing some of my recipes on the page to keep it interactive. I later on decided to give cooking classes as catering was a bit too hectic, and consumed a lot of my energy. Thanks to Facebook and Twitter, I could advertise almost for free for my classes as well. The reputation I have built from my blog over the past years allows me to accept invitations from various eateries to review their menus and give my honest feedback to help them understand their consumers. Not only this, my page is also my portfolio in a way; it proves my abilities and lets me be a part of various magazines as a freelance writer. Social media is more responsive, interactive, and much more convenient than people having to leaving their homes for the very same tasks. The feedback you get from people keeps you going and helps you improve. So, when is the right time to post something on the social media, you may ask. Early morning? No. Afternoon? No. Evening? Yes. And why? Because people are home from work, schools, and colleges, and have some time to spare to spend on these websites. People have started taking internet and social networking sites (SNS) very seriously. 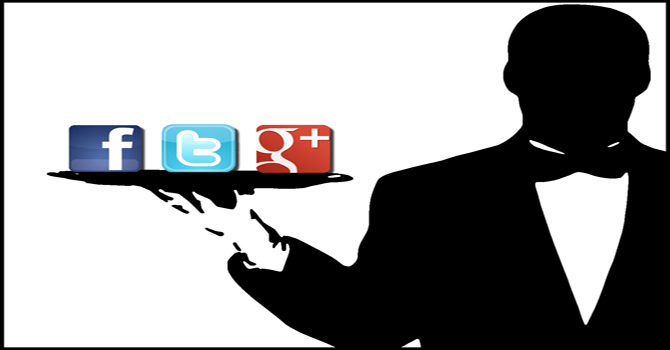 So much so that social networking websites are more attractive and popular than blogs. Our customers are always logged on to one website or the other, making it easy for us entrepreneurs to reach out to them. A person only needs a basic understanding of the internet to be a member or a part of such social networking websites. The era of digital information has made us all very lazy, full-time consumers, and without doubt this is an opportunity for entrepreneurs to enjoy the benefits of social media and the internet - everything is literally just a click away; whether it is ordering food, or deciding where to get food catered from for a wedding, or getting a birthday cake! Deep fry the potatoes first until they achieve the desired level of crisp and color. Remove the access oil and dump them in a ovenproof (preferably glass dish) and sprinkle with salt. Make the tomato sauce by stir frying onion and garlic till soft. Do not brown. Now add the tomato paste, salt, pepper, herbs, crushed red chilies. Mix well and cook till the sauce thickens a little. 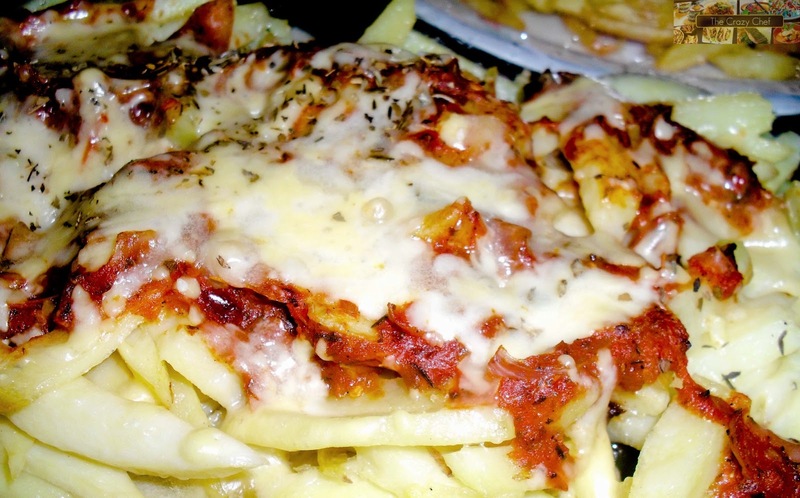 Now pour the sauce over the fries, and top with grated cheese. Pop it in the oven for a couple of minutes till the cheese melts. Serve! *You can also add juicy cooked pieces of chicken if you want. Simply, marinate some boneless chicken cubes in vinegar, salt, pepper and small green chilies. Stir fry them on high heat for about 4 minutes and toss them in with the fries. This has to be the simplest calamari dish ever! Try it out! 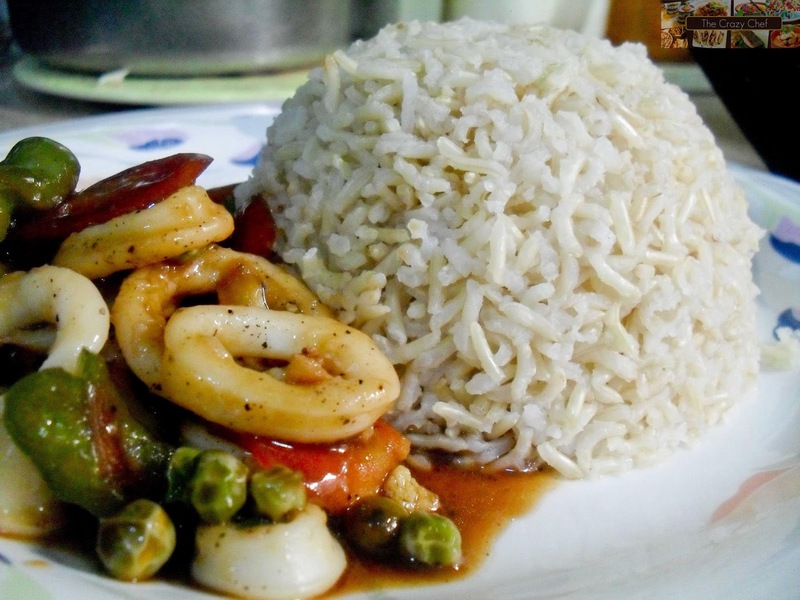 Heat oil in a pan and stir fry the calamari rings, sprinkling with salt and pepper, on high heat for two minutes (over cooking will cause the squid to become rubbery, so avoid over-cooking). Remove and keep aside. In the same pan heat some more oil and stir-fry the veggies on medium-high heat. Add salt, pepper, oyster sauce and soy sauce. Mix well. Once the veggies are done add the calamari mix well and serve with rice! Mix together garlic, soy sauce, Worcestershire sauce and 1 tbsp of oil in a bowl and marinate the beef fillets in it (you can also add meat tenderizer, if you want). At least two hours, overnight works best. Boil and mash the potatoes. 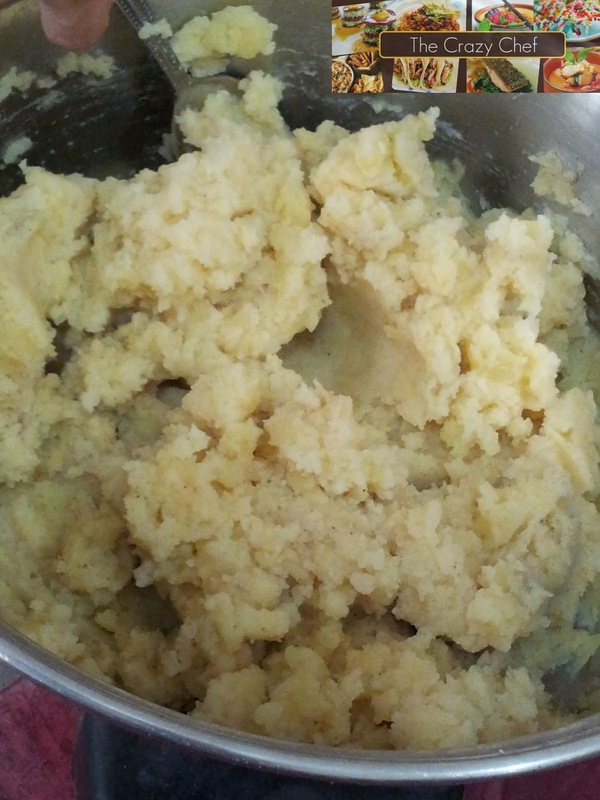 Mix 2 tbsp of cream and 2 tbsp of milk; salt, and pepper while mashing the potatoes. Keep aside. In a pan, heat some butter and stir fry the sliced mushrooms. Add salt and pepper. Cook for two minutes then add 200ml-250ml of cream. Lower the heat. Add salt and pepper, mix well and take off the heat. Heat a griddle pan or a non stick pan, brush generously with butter and 1 tsp oil and grill the fillets, medium-high heat, for about 4 minutes each side. Prick with a knife or fork to check whether the fillet is cooked through or not. 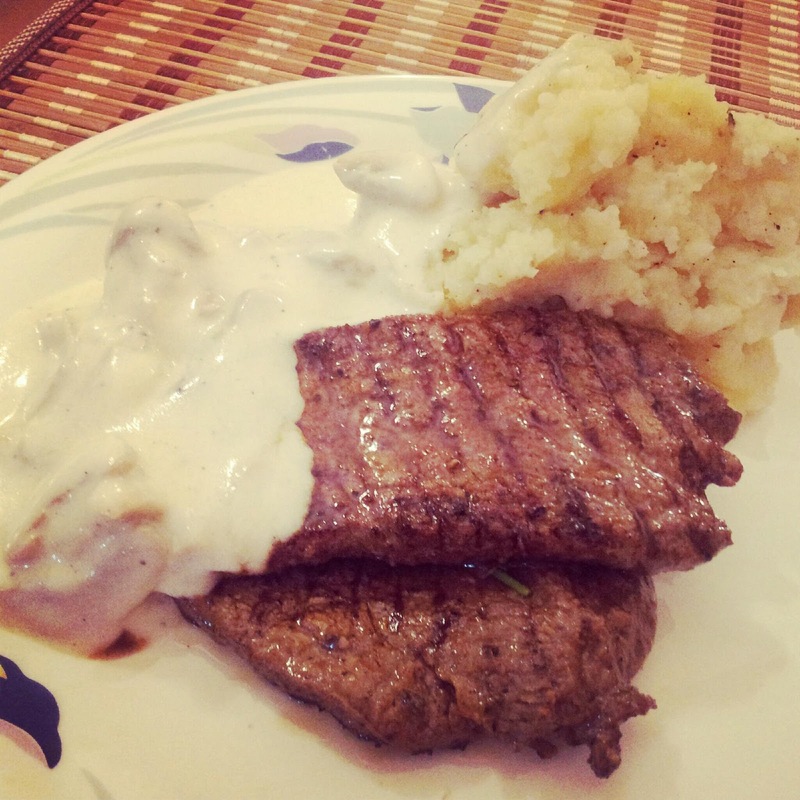 Once done, serve with mashed potatoes and mushroom creme sauce!